Rojo for Marcos (65)	 None. 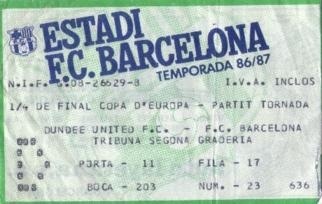 There have been many famous European nights for us in Europe, but this one would be difficult to surpass. Playing controlled football United quietly contained the Spanish side and despite losing an unfortunate goal just before the interval, struck back in the second half to deliver two late killer blows and complete a most notable double over last season's European Cup finalists. Goal mouth action was limited in the first half with Billy Thomson making a couple of early saves. Our first effort was a free kick by Iain Ferguson which went fractionally over. Shortly afterwards Kevin Gallacher was unlucky when he couldn't quite get enough power behind his shot following a Paul Sturrock cross. Five minutes from half-time came a major set-back. From a corner Paul Hegarty's clearance struck a Barcelona forward and rebounded to Caldere whose shot was deflected and evaded the combined efforts of Billy Thomson and Maurice Malpas on the line. From the outset of the second half, we looked more dangerous and were unlucky when Paul Sturrock's shot was only inches wide. Paul then split their defence to find Kevin Gallacher but Zubizarreta smothered his run in on goal. Iain Ferguson's glancing header from a Paul Sturrock cross almost brought an equaliser. At the other end Terry Venables side's scoring attempts were more long range and even more off target. 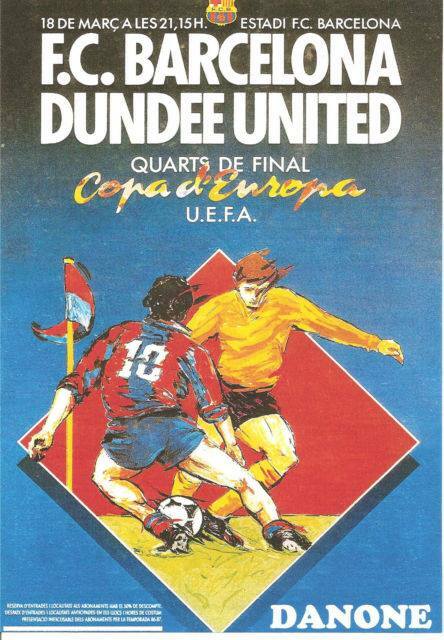 At worst extra-time appeared to be our fate until Paul Sturrock won a free-kick on the left. From it, Ian Redford floated over a perfect cross which John Clark ran in to head into the net via the underside of the bar. Bearing in mind the away goals ruling, Barcelona then required two goals in four minutes, but any shadow of doubt was removed as we created a goal out of retaining possession. Jim McInally set Paul Sturrock free on the left and Paul advanced in on goal before sending in a chip which Iain Ferguson headed in to equal our famous victory of 21 years ago.